Inspired by the Silmarillion (J. R. R. Tolkien). This work is combination of watercolour painting and pencil drawing. ... or just tell me your idea and I can create something special for you. GORGEOUS!!! I love your art! Very beautiful, I love your style. The one on the left is Gil-Galad, i think, but who's that on the right? WOW! Awesome and beautiful artwork, congratulations! This is really beautiful – and so much details in there! This is jaw dropping in its beauty. I had that picture sitting around in booksmarks/browser sessions for a long time now waiting to comment. Maybe I already dreamt that I had written something. Stupid "real life's" burdens keeping my so busy sometimes. Makes me forget so many beautiful things in life. So what I wanted to say is that I really like this image and it actually makes me think, ah yes, these are Vanyar elves residing in Aman. I like their noble and slightly androgynous look, very elvish. My only complaint is: Did they have swords? 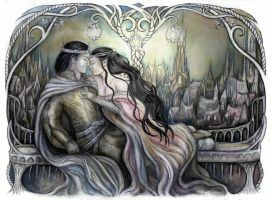 The sword makes a good graphic element in the picture, for him to rest upon, and as a third and balancing straight line downwards - but wasn't the time just before Feanor was banished to Formenos the time where swords where first invented? And wasn't it only among the Noldor (where Melkor tried to gain influence)? And the tree(s) still seem(s) to be intact here. Also the flow of colours is interesting, from the warm to the cool tones and back. Thank you for your beautiful comment and my apologies for that "sword mistake". I'm a great Tolkien fan, but not an expert, so thank you for the detailed info about Vanyar. great tolkien work. perfect blend of celtic and art nouveau, stylized and not over realistic, looks like it could be a page out of some awesome illuminated manuscript in rivendell telling the history of the elder days. wonderful! Thank you. I'm honoured you like it and I really appreciate your nice words. Your art is epic. They look just like a beautiful book cover which draws me in. I cannot think of anyone else you deserves it more! awesome! I did something very similar after I read the book! I immediately recognized them as Tolkien's Elves. Wow. Hello there fellow Deviantartist. I am pleased to let you know that you have been featured in my monthly journal: Drawings, Real and Imaginary ([link]). Please continue the excellent work. Take care.